Did you know: tea is the most drank drink in the whole wide world? Even water cannot compete with that taste. And now that I know that I want some even more. To the chai tea! I’m writing on my phone for the first time so this post is going to be short. Today I was taken to a trendy hipster type place I never knew existed. It consists almost entirely of food. The exceptions are a clothing store and a live band. They weren’t too shabby. But back to the food. They had everything! All the kinds of food including wood fire pizza, Korean, Vietnamese, Hungarian, Vegan. The vegan one had a whole bunch if different fresh salads, a hot pot, falafel, some weird and tasty seaweed roll thingy and a couple of desserts to choose from. I had a massive craving for potato so went with a potato salad. Where to find this? Every Saturday from 4pm you’ll find this place of awesome and wonderment at the industrial estate in Miami, QLD (Australia). The Miami Marketta. I want to add a picture, but the phone is being a b-hole. To the next step: becoming hipster! (But not really if I do that please just shoot me). I just ate the biggest mango in history! It was measured at 15 by 13 by 10 cms, and it tasted like bliss. The mango came off my dads tree. Last year dad had more mangoes than he had pairs of holey undies (who understands guys and their holey undie fetish). This year he got a grand total of 11. All massive. All amazing looking. 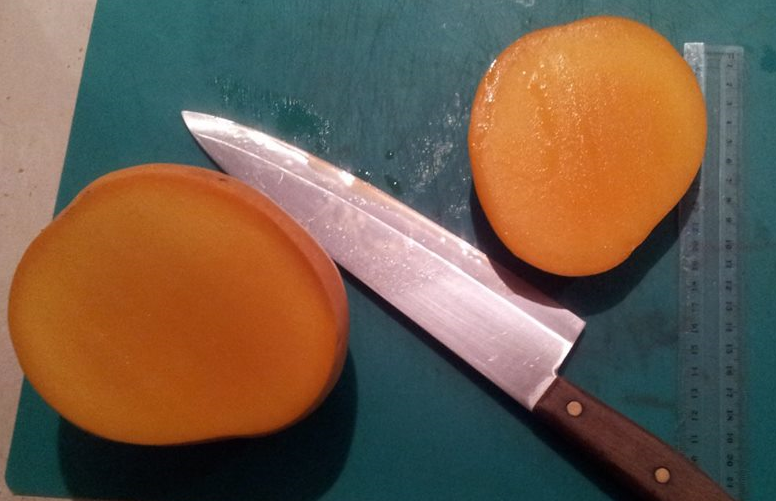 If you look at the picture, you’ll notice the mango is the almost the same length as a kitchen knife.